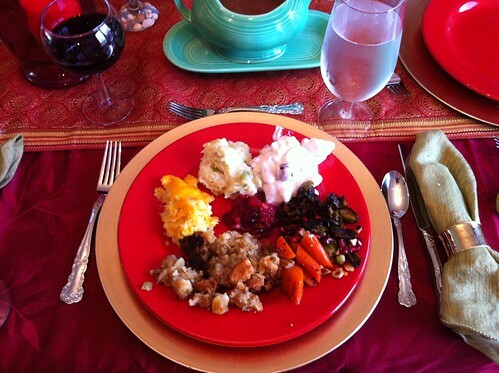 thanksgiving, a photo by unglaubliche caitlin on Flickr. We were Mass. at allie's house for thanksgving, a very thanksgiving-y state. didn't allie do a nice job with the table? note the gold chargers and grandma's fiestaware gravy boat. clockwise from center: cranberries with orange and walnuts, 24 hour salad, roasted brussels sprouts with hazelnuts and pomegranates, gingered carrots with rosemary, stuffing, aunt deann's cheesy corn cassarole, and berks county potato filling. not pictured: salted carmel pie, chocolate merangue pie, and pumpkin pie of course!